Last year we had tomatoes coming out of our ears, so while searching the web, I found this recipe on www.mysquarefootgarden.net/–this should come in super handy when we are overloaded with tomatoes! Line cookie sheet with foil. 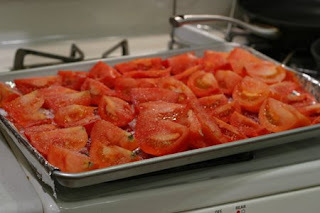 Wash and quarter tomatoes (take off stems, but no need to peel, core, or seed) and lay skin-side down in the pan. Sprinkle with kosher salt. Bake at 400 for 1 hour. Cool until you can handle them, then blend. Pour into freezer containers and freeze (can also do ice cube trays, then put in baggies). When you are needing marinara sauce, just defrost and add to sauteed onions and garlic. Season–enjoy!